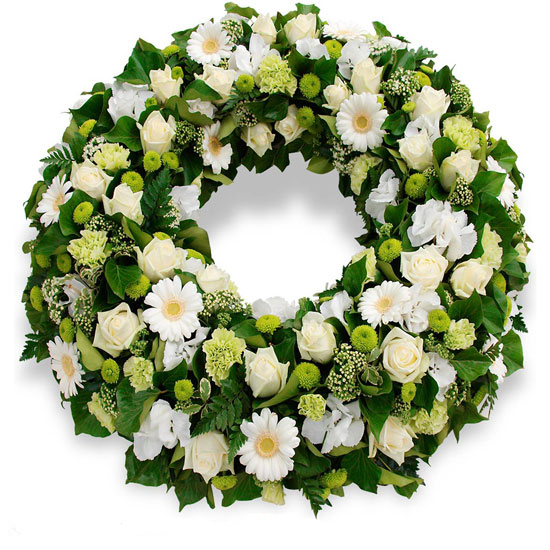 For a beautiful funeral tribute, opt for this generous wreath of flowers. Composed of roses and a multitude of other white and green seasonal flowes and foliagee to express your deepest sympahty and regrets. Your order will be prepared by a skilled florist from the Teleflora network, chosen by Aquarelle to compose and deliver this funeral arrangement, which requires specific expertise and precise delivery conditions, to the destination of your choice (home, funeral parlour, place of worship, ceremony or cemetery). This floral arrangement includes a stand or container which is not suitable for cremation.